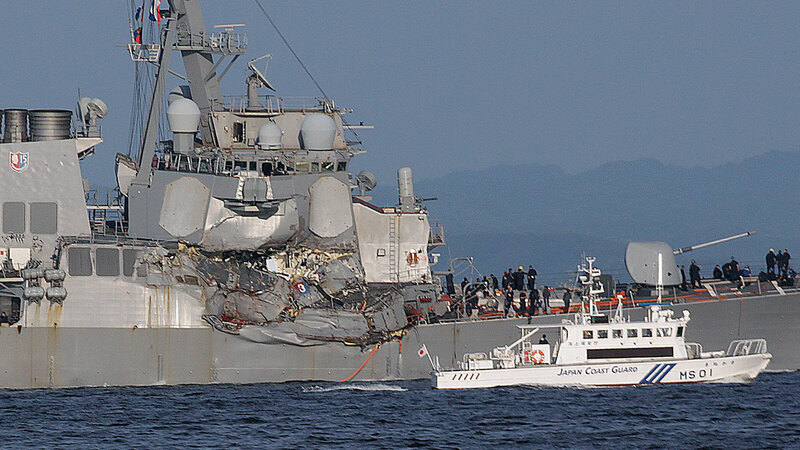 YOKOSUKA, Japan -- Navy divers found a number of sailors' bodies Sunday aboard the stricken USS Fitzgerald that collided with a container ship in the busy sea off Japan, but a spokeswoman said not all seven missing had been accounted for. Japan's coast guard officials said the sea and air search was still continuing at the site of the collision, 56 nautical miles (103 kilometers) southwest of Yokosuka, home to the 7th Fleet. At least three other crew members, including the captain, were injured in the crash, which damaged two berthing spaces, a machinery room and the radio room and exposed a mangled mid-right side of the ship. It wasn't clear how extensive the damage is below the water line.